Farrar, Straus and Giroux (BYR), 9780374301859, 40pp. When Lucy sees an ad in the newspaper for a unicorn, she sends in her twenty-five cents and waits four to six long weeks for her very own unicorn to arrive. She imagines the flowers that she'll braid into his beautiful pink mane, and she even picks the perfect name for him: Sparkle. But when Sparkle arrives, his ears are too long, his horn is too short, he smells funny--and oh, he has fleas. 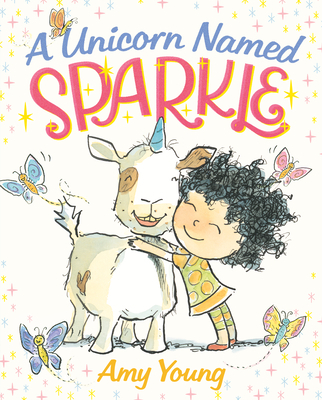 Lucy isn't pleased, but in the end she warms up to Sparkle and realizes that even though he wasn't exactly the unicorn she wanted, he might be just the one she needs. Amy Young trained as a fine artist at Yale and received an MFA in painting from Indiana University. She then went on to earn a law degree from Harvard and worked as a lawyer for several years. She now devotes herself full time to writing and illustrating, and is the creator of the popular Belinda picture books.